I wrote recently about the idea of using medical marijuana to help NFL players dealing with pain from football. I am no expert on pain management, so I’m not necessarily advocating it. But we need to figure out a way to keep players off narcotics. Last week, more news that football faces a crisis with pain management surfaced. 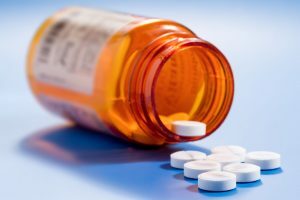 I discussed the issue of painkillers in the NFL in depth in my latest column for The Post and Courier. The NFL, and its team doctors and athletic trainers, face another public relations nightmare. Last week, the Washington Post reported data on the use – and apparently misuse – of narcotics and other painkilling medications by the medical staffs of NFL teams. The information came from legal documents of attorneys for over 1800 former players suing the league. The players claim long-term health issues related to what they allege were improper practices related to the administration of medications. According to Rick Maese of the Washington Post, the average NFL team gave 5,777 doses of anti-inflammatory medications in the 2012 calendar year. These are over-the-counter medications like ibuprofen or naproxen, or injectable varieties like Toradol. They also gave an average of 2,213 doses of controlled medications, such as Vicodin. These numbers could suggest teams gave each player 6 to 7 pain pills of some type each week of the season. It’s possible that athletes with serious injuries or surgeries could account for a large percentage of the doses. Still, these numbers are eye-catching to say the least. The NFL denied the allegations to the Washington Post, calling the claims “meritless” and vowing to “vigorously defend these claims.” The league argues that it provides every NFL player with the highest level of care. This lawsuit implies that the NFL has created a culture in which its doctors and athletic trainers will do whatever it takes to get athletes back on the field. Those practices include giving out anti-inflammatories and narcotic drugs after games, having players get injections of Toradol before games to numb the pain without telling the players about Toradol’s risks, and transporting controlled substances across state lines to give them to players after road games. I don’t work with an NFL team, so I can’t support or defend the accusations against NFL physicians or athletic trainers. I’d rather find a solution to football’s pain problem. A 2014 survey of 27 NFL teams found that an average of 26.7 players received a shot of Toradol before each game. That number suggest that essentially half of the players on each roster were shot up to play. In 2011, a survey of 644 retired NFL players found that more than half used controlled painkillers during their careers, and about 70% of them reportedly misused the drugs. 22% of the players who took them consumed six or more pills each day. 7% of the players still used those drugs, even in retirement. That rate of opioid use is four times higher than that of the general population. Similar pain issues in boxing? Football is a brutal sport, with enormous, lightning-quick athletes hurling themselves into opponents. Athletes are going to suffer injuries. Players are going to have pain after every game. In that sense, the only sports I can think of with similar issues could be boxing and mixed martial arts. Michael Golemis, a former professional boxer who now coaches boxers in Charleston, stated that the use of painkillers in some form is probably common from entry-level boxers to the elite level. “It’s the nature of the business with blunt trauma. It’s a rough sport. They are going to take what they need to get them to the next fight,” Golemis observed. Unlike the NFL’s weekly contests, though, boxers fight anywhere from once a month to 1 to 3 times a year. What then do we do about pain in football? I’ll skip the specifics of this lawsuit. If team physicians and athletic trainers are illegally or unethically providing these drugs, they can defend themselves. But I would suggest that this isn’t just a medical staff issue. As we’ve seen with many NFL players admitting they hide symptoms of a concussion to stay in a game, I bet many players will do whatever it takes to play through pain. They don’t want to lose their spot on the roster because they’re hurt. If the team doctor won’t give Toradol or Vicodin, they might find a doctor outside of the team who will. Maybe we need to try to find ways to decrease the wear and tear on athletes’ bodies. Could we double the length of the season and have each team play every two weeks to let their bodies recover? Could we create larger rosters so athletes would be on the field for fewer plays each game? Or should we look at alternative pain treatments, like medical marijuana? At the end of the day, the most straightforward solution – somehow decreasing the violence of the sport – is not likely. As Golemis noted how boxing fans love watching guys get hit, football fans would probably reject any steps that bring the sport even a little closer to touch football. Today’s NFL is a painful sport to play. We must find better ways to manage that pain. 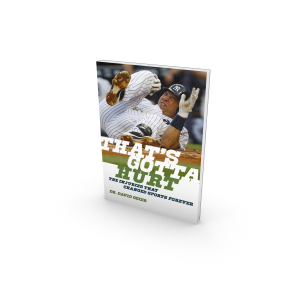 I discuss some of the issues facing the sport of football, especially head trauma and CTE, in my new book That’s Gotta Hurt: The Injuries That Changed Sports Forever. If you have kids who play football, you need to read it! Pre-order your copy now from Amazon, Barnes and Noble, Books-A-Million, IndieBound or Powell’s Books. Note: A modified version of this article appears as my sports medicine column in the March 16, 2017 issue of The Post and Courier. NFL abuse of painkillers and other drugs described in court filings. By Rick Maese. Washington Post. March 9, 2017. Episode 291: Can simply injecting saline into the knee help arthritis pain? Cortisone might get athletes back in game quicker, but does it send wrong message?